Paleontologist L.J. Krumenacker discovered fossils near Paris, Idaho. MSU Photo by Sepp Jannotta. Montana State University paleontologist L.J. Krumenacker discovered a window into Early Triassic marine life by way of fossils he found near Paris, Idaho, more than 15 years ago when he was a teenage fossil hunter. Now, Krumenacker is part of an international team of scientists, led by French paleontologist Arnaud Brayard of Université de Bourgogne, whose research into the 250-million-year-old fossils Krumenacker discovered was published Feb. 15, in the journal Science Advances. A doctoral student in the MSU Department of Earth Sciences in the College of Letters and Science, Krumenacker is co-author of the paper, “Unexpected Early Triassic marine ecosystem and the rise of the Modern evolutionary fauna,” which describes the assemblage of fossils from marine animals that coexisted in the same ecosystem after a mass extinction wiped out 90 percent of all existing species from the planet. Krumenacker said the fossils he discovered at the Paris Canyon site show a surprisingly diverse biota of animals from roughly 1 million years after the worst mass extinction in history, including a number of animals not previously known from that time period. This challenges the theory that the 5 million years following the mass extinction were a time of low diversity for benthic marine organisms, or organisms that live at the lowest level of a body of water, and suggests marine life recovered more quickly after the mass extinction than previously thought. Among the 30 different lifeforms that have thus far been identified from the Paris Canyon site are leptomitid sponges, mollusks, starfish, ammonoids, shrimp, lobsters, shark teeth and squid-like mollusks with numerous hooks on their tentacles. This type of squid-like mollusk was previously thought not to have originated until 50 million years later. 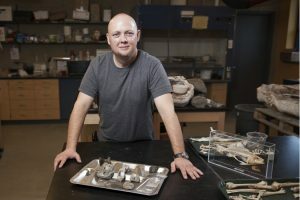 “The presence of the sponges and the shrimp really piqued the interest of my co-authors once they saw them,” Krumenacker said, adding that it wasn’t until recently that the sponge fossils he found in the late ‘90s were identified. “The paleontologists I had previously shown the fossils to weren’t sure what they were,” he said. Krumenacker said the discovery of the sponge fossils was also significant in another way. Krumenacker said he was excited to share the fossil locality with his co-authors and learn of its importance to science, especially since he discovered it as a young fossil hunter, before he had any academic credentials. Krumenacker said he returns to the site every year to see what other discoveries he can make. Last year, Krumenacker was among a team of paleontologists who identified several new types of dinosaurs through fossils found in eastern Idaho, including an ancestor of the Tyrannosaurus Rex.